Crafting Solid and Engineered Floors — Essex & Co.
Essex & Co. is a family business that produces high-end, beautifully-crafted wood flooring. We are based just outside New York City. Our products come from local and sustainable sources. We work with clients to create the wood products required for their specific job. As manufacturers, we provide the background and expertise to provide the highest quality control and customization. We have partnered with a select number of local and European mills to provide the highest quality and the greatest range of wood products. We offer engineered, solid, locally grown, reclaimed, FSC certified and European wood products. We work with a variety of environmentally friendly finishes. All of our finishes have no VOC. 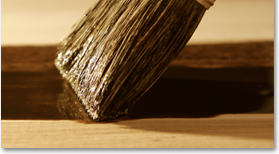 We use everything from hard-wax oils to polyurethane finishes. We also offer different surface treatments like wire brushing and hand scraping.